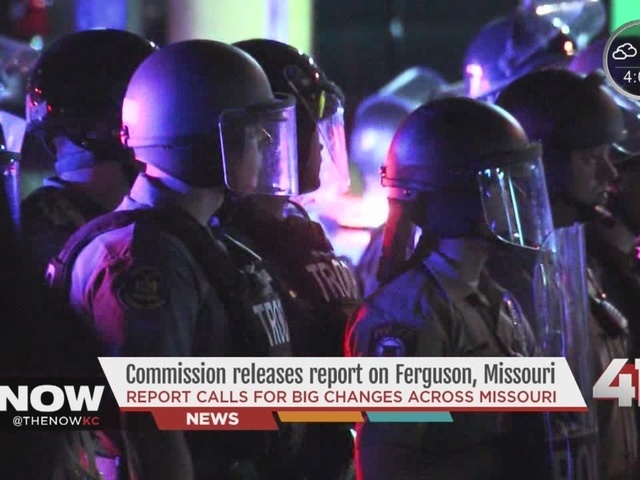 The Ferguson Commission, a 16-member panel appointed by Missouri Gov. Jay Nixon in November, released a copy of its 198-page report online on Monday. "Over the last year, we've listened a lot. We've learned a lot and things are getting better, but they are going to get better together," Nixon said in a news conference. The report acknowledges that the commission has no power to enact any of the proposals, but Nixon has said the commission has the full support of his office. Brown, 18, who was black and unarmed, was killed by Ferguson officer Darren Wilson during a confrontation in August 2014. A St. Louis County grand jury and the U.S. Department of Justice declined to prosecute Wilson, who is white, but the shooting spurred a national "Black Lives Matter" movement and led to protests and rioting in and around Ferguson. The report said the panel heard from many black residents of the St. Louis region "who do not feel heard or respected when they interact with the police or the courts. They do not feel that they are treated in an unbiased way." Relations with police were strained in parts of the St. Louis region before the shooting, partly because of excessive force, the report said. "The regular use of force has led many citizens to view the police as an occupying force in their neighborhoods, damaging community trust, and making community safety even more difficult," the report said. It suggested new use-of-force policies, officer training and a change in department culture. It also recommended establishment of a statewide database of use-of-force incidents and statistics. While it would not identify officers involved, the database would be publicly available, with all police departments compelled to provide information. The report notes that St. Louis County has 81 municipal courts and 60 municipal police departments - and recommends consolidating at least 18 of those departments into just three that would oversee different areas of north St. Louis County. The fragmentation "is not only costly and a grossly inefficient use of taxpayer resources, but more importantly presents as an impediment to justice for many of our region's citizens," the report said. The commission also recommended a statewide plan to deal with mass demonstrations. "Our findings are that this fragmentation of courts and police departments is not only costly and a grossly inefficient use of taxpayer resources, but more importantly presents as an impediment to justice for many of our region's citizens," the report said. The commission also recommended changes in several other areas to address social and economic divisions highlighted since the shooting. It suggested developing a statewide plan to deal with mass demonstrations that focuses on preserving life and recommended establishing school-based healing centers to address behavioral and health issues. "We believe that if we attempt to skirt the difficult truths, if we try to avoid talking about race, if we stop talking about Ferguson, as many in the region would like us to, then we cannot move forward," the report says. "Progress is rarely simple, and it rarely goes in a straight line." "People should not think that this is just some bill that's going to pass that's going to solve relationship issues. This is not just some resolution that somebody passes and says, 'Everyone get along,'" Nixon said. "We've got to rebuild trust in some areas, so we're going to be working hard over the next 18 months to do that." Some observers were skeptical about the value of the report. Remy Cross, a criminologist and sociologist at Webster University in suburban St. Louis, isn't optimistic that it will lead to significant change. 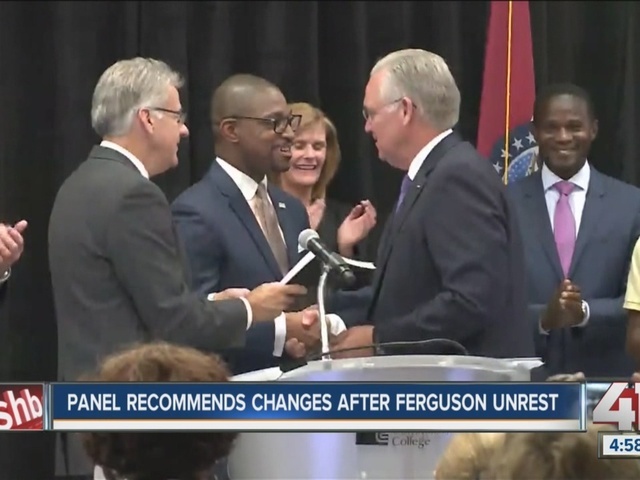 Ferguson Mayor James Knowles III said his community has made several changes, including installing a new police chief and municipal judge. He was concerned that the name of the commission is misleading. "One of the worst things they could have done is naming it 'The Ferguson Commission,'" Knowles said. "That's not what it's about. When you do that, it makes it real easy for other communities not feeling the pressure to ask, 'Why do we need to change? There wasn't a riot in our section of the region.'"